Arnold Schwarzenegger is in Melbourne to promote his body building and multi sports competition, but he is not the only one showing his strength in the city, after a dominant display from Mercedes. have a read of Andrew Benson's report. We'll be back early on Saturday morning to guide you through third practice, and then qualifying. Join us again then at 02:30 GMT. See you later! Williams driver Valtteri Bottas, who was fifth fastest: "It felt good but we'll get more out of the car. The times could be telling a little lie." Lewis Hamilton, after finishing second fastest behind Nico Rosberg in practice: "Qualifying between me and Nico will be as tight as it always is." Five drivers dipped below 1:30 in the second practice session, while Toro Rosso rookie Carlos Sainz Jr got plenty of time out on the circuit, getting 73 laps under his belt across the two sessions. "Mercedes are miles ahead. Difficult to call between Ferrari, Williams, Red Bull, bearing in mind usual fuel-load differences of those teams. "McLaren-Honda, meanwhile... oh dear. Likely to qualify right at the back, Manor permitting." NICO ROSBERG FINISHES FASTEST IN SECOND PRACTICE FOR THE AUSTRALIAN GRAND PRIX. Nico Rosberg, whose time of 1:27.697 remains the benchmark, is back in the pits. Is that him done for the session? Nope, he rolls out for one last venture on to the circuit. Less than a minute left. Williams: 27 laps on the board and it's pitstop practice in the final 5 minutes of FP2. Jenson Button reports a loss of power in the McLaren as heads into the pitlane and that could be him for today with a little over five minutes remaining. "The two Mercedes are about eight tenths/ninth tenths of a second on average quicker than the two Ferraris. I would say that Valtteri Bottas in the Williams is pretty nip and tuck with the Ferraris in the long runs. "It is difficult to see where the Red Bulls are because Daniil Kvyat is the only one on track at the moment and it will not be until tomorrow until we see their potential." Mercedes: Slightly longer runs underway: 7 laps apiece thus far for Lewis Hamilton & Nico Rosberg. Practice pit stops also planned before FP2 ends. Into the closing stages of second practice and once again it is the Mercedes duo of Nico Rosberg and Lewis Hamilton who are leading the way. Just over half a second behind the Mercedes is Sebastian Vettel, with his Ferrari team-mate Kimi Raikkonen fourth fastest. Earlier we asked you to pick your favourite car from a selection of seven - and the winner is... the 'Shark nose' Ferrari 156. Phil Hill, pictured, drove it to the 1961 F1 drivers' title. Take a look at the full result to see what percentage of the votes went to which cars. Carlos Sainz Jr spins the Toro Rosso, going down a small escape road at Turn 15 before recovering and going on his way once again. All good. "Mercedes are setting into race mode already while everyone else is still fine tuning their cars and getting them used to the track." A little under 30 minutes left in this session and Nico Rosberg and Lewis Hamilton are on to their race simulation. Kevin Magnussen: "The crash was my mistake. Just lost the rear on the entry and unfortunately hit the wall and damaged the left front. Another day tomorrow!" Jenson Button improves on the soft tyres with a 1:31.428 moving him up from 15th to 13th. Lotus: Nicely full garage with both cars in. Just a bout of tweakerage before unleashing both #E23 Hybrids again. "Jenson Button is out on the circuit in the McLaren, he has done 10 laps so far and is out on the soft tyres. The front of the car doesn't look like it is working at all, it is very lazy to turn round the corners and it looks like a bit of a slow lap." Rachel T: I think poor old Jenson might end up wishing he had retired after all last year. McLaren Honda have Mount Fuji to climb. PhilSlocombe: If anyone can challenge Mercedes, it will probably be Williams. Here's the order coming up to an hour into FP2. There's just the sound of a solitary Force India out on the circuit, with Nico Hulkenberg keeping the crowd moderately entertained while everyone else is back in the pits. Mercedes: Nothing to separate our boys already in 2015 - A couple of hundredths in it during #FP1, just a tenth so far in #FP2! So close! "I am at Toro Rosso's garage where Max Verstappen is and he isn't going to be getting into that car anytime soon. A suspected battery problem means the floor is off." And there it is! Nico Rosberg is round with a 1:27.697 to nudge off Sebastian Vettel from P1. Lewis Hamilton was not far behind Rosberg in switching to soft tyres and he goes a shade slower than his Mercedes team-mate, slotting into P2 with a 1:27.797. McLaren: Jenson Button takes on some flow-vis paint before heading out of the box. Williams Valtteri Bottas has also switched over to the soft tyres. He has the eighth fastest time so far in FP2. Sparks kick up from underneath Pastor Maldonado's car, the titanium skid blocks making it look more dramatic than it was. Meanwhile, Nico Rosberg straps soft tyres on to his Mercedes and we could be seeing a new benchmark time very soon. "Marcus Ericsson ran on to the kerb, nothing untoward, but immediately something failed with the left rear suspension." Smoke plumes out of the left rear of Marcus Ericsson's Sauber and he is trying to limp it back to the pits. It was early in the lap so he has a fair distance to go in that condition. "Something has broken," he reports over team radio. "Rear suspension I think." McLaren need the MP4-30 to rack up a few laps today and Jenson Button is doing just that at the moment. His best time so far is a 1:33.057. Could we see a few new lap records set this season? Times in testing suggest so - highlighted by Nico Rosberg's benchmark time of 1:22.792. Pirelli predicts lap times could be two seconds quicker than last year. "The new rear structure increases traction and helps drivers get onto the power earlier: one of the factors that has led to faster lap times this year," says Pirelli Motorsport director Paul Hembrey. Nico Rosberg and Lewis Hamilton are back out on the circuit. Rosberg, still on the medium tyres, goes third with a 1:29.937. Kimi Raikkonen goes into P1 with 1:28.842 on the soft tyres, a time which is then bettered by Sebastian Vettel, who posts a 1:28.412. Ferrari have sent out Sebastian Vettel and Kimi Raikkonen on the soft tyres. Let's see what times they can do now. Mercedes: Speaking of the weather, it's a beauty here in Melbourne: blue sky, sunshine, air 20deg, track 40deg... mega! Mega? Is this the '90s? Kevin Magnussen's McLaren team-mate Jenson Button heads out for the first time in FP2. He has yet to set a lap time in this session. Mercedes: Session resumed: our boys are parked for the time being. Bit of radio chit chat going on. You know, about the weather... the usual. Williams driver Valtteri Bottas: "A new season and the first time we see where everyone is competitively. "The weekend will be interesting but also important as we have to be able to have a strong start and make sure we gain the most from the weekend, especially as other teams improve. "You never know how other teams will progress throughout the season, so points here are key. I like Melbourne, the first race is really when the gloves come off so qualifying will be an exciting session." The track is green and out pops Valtteri Bottas in the Williams. Kevin Magnussen clambers on to the back of a motorbike as his McLaren is lifted away by the recovery vehicle. The session should be back under way shortly. If you haven't already noticed, Lewis Hamilton's Mercedes is sporting #44. As world champion, he can slap number one on his car but he has stuck with the same number he had during his karting days. That means there is no number one car on the grid for the first time since 1994. Alain Prost retired as 1993 champion and Damon Hill took number 0 for that year, having had it the previous season. With 20 minutes gone it is Sebastian Vettel with the benchmark time. Lewis Hamilton is currently second fastest, with Kimi Raikkonen third and Romain Grosjean fourth. McLaren: Kev has hit the wall at Turn Six. He's reported that he's fine, but that's a red flag. Session stopped to retrieve the car. Niall Ash Raff: It's going to be a three horse race between Hamilton, Rosberg and Vettel, I think! Francis Waso: McLaren an absolute disgrace! Forget new engine supplier. This always happens. Unprepared & off the pace at start of year! Kevin Magnussen runs wide at Turn 6, seemingly locking up the rear of his McLaren and runs off and into the tyre wall. The red flag is waved as Magnussen steps out of his stricken car. Sergio Perez has a little wobble, running wide, but recovers and is back on his way. Perez is not the first to have a brief spell off the circuit in this session. The wind has picked up a little and seems to be having an impact. Daniel Ricciardo watches on from the Red Bull garage as his old team-mate Sebastian Vettel goes fastest in FP2 with 1:29.801s. You may notice to right of this page if you are on a desktop that we are running a vote on right side of this page on seven "best-looking F1 cars". It is not a definitive list, but if you fancy picking your favourite you can do so now. Remember to check terms and conditions. And Daniel Ricciardo will also not be heading out on to the circuit after his engine change. Felipe Massa is not heading out in FP2, there is a water leak on the power unit of his Williams, with the team saying it "has necessitated the removal of the power unit". Mercedes: Lewis Hamilton is ready for more! Green light well and truly shining... let's go! Marcus Ericsson joins his Sauber team-mate Felipe Nasr in heading out, swiftly reporting over team radio that there is "a really strange feeling on the brakes". "I am stood in front of the Manor garage and there is a lot of action going on but I am afraid we will not see any track action this afternoon. They are having one electronic glitch after the other at the moment." The pit lane is open and a Sauber heads out! Felipe Nasr takes the C34 out on to the circuit for the first time today. Not great news for Daniel Ricciardo and the Australians in the stands as Red Bull tweets: "Not the start we were hoping for with an engine change for Daniel - the team are doing their best to get him out this session." "Lewis Hamilton's low-key public demeanour this winter has belied a man who says he is 'generally happy' and is clearly very determined to win a third world title. He was in a sunny mood when we spoke for his BBC Sport column on Thursday. And there was a moment of levity in the official news conference when Max Verstappen's age was discussed. 'I've only just realised I'm the oldest driver here for the first time,' Hamilton said. Then he turned to the Dutchman and said: 'You were born in '97?' 'Yup,' Verstappen replied. 'Jeez,' Hamilton said. 'I signed my first contract with McLaren then. Wow.'" Remember this from last year? Lewis Hamilton getting stopped and asked for his pass at the entrance to the paddock. The poor old security chap might have had a few post-it notes stuck up around the entrance this time reminding him not to stop the drivers, but he has still had his work cut out this year, with extra drivers looking to get in. This was Giedo van der Garde waiting to get his credentials sorted earlier today. We've got 15 minutes until second practice gets under way at a gloriously sunny Melbourne, enough time for you to have a gander at the highlights from first practice. We've got them online now. Lotus: One of the few things that can bring an entire F1 paddock to a standstill... Is it a plane, is it a bird?!! "The chat in the paddock in the break between sessions has focused on Sauber, who are in all sorts of trouble over the legal case involving Giedo van der Garde. The team are batting away all inquiries with a firm 'no comment' but it is all getting rather messy. "The latest ruling is due any moment and team principal Monisha Kaltenborn risks arrest for contempt of court, and the team could even have their assets frozen. "Everyone is watching developments with interest, while expressing bemusement at how a team run by a lawyer could apparently have five drivers under contract for this season - Van Der Garde, nominated race drivers Marcus Ericsson and Felipe Nasr, and last year's drivers Adrian Sutil and Esteban Gutierrez. It remains to be seen whether the team try to run in practice two." Sauber drivers Felipe Nasr and Marcus Ericsson spent a period of first practice sitting patiently in their respective cars for an OK to head out that never came. The ongoing saga with Giedo van der Garde's claim for a Sauber seat continues. A court ruling says he should be allowed to compete this weekend, but it is unclear whether Sauber will drop one of their current drivers to accommodate Van der Garde in Melbourne, or race with Ericsson and Nasr, risking contempt of court. "It's a glorious day in Melbourne, but the outlook is not sunny for anyone hoping Mercedes will face a challenge this season. If anything, the world champions appear even further ahead than they were in 2014. As for the teams behind them, Williams as expected appear to be in the best shape. We will learn more in the next hour and a half, when the teams will also do some race preparation." Hello! Welcome back to our coverage of Australian Grand Prix practice. Manage a snooze? Just got up? Whichever it is, here is a brief summary of the key points from first practice. So what did we learn from that session? Not a great deal more than we already knew. Mercedes look dominant as expected while it was more of the same for McLaren. Carlos Sainz Jr and Max Verstappen showed plenty of promise, with the Toro Rosso pair finishing the session fourth and sixth respectively. Probably the biggest amount of intrigue related to the cars that did not do any running during the session - Sauber and Manor. Will they get out in FP2? We shall see. Have a power nap, grab a bite to eat. We'll be back at 05:00 GMT ahead of second practice, which begins at 05:30. See you then! Williams: A good start to the weekend. Now we go to work between sessions to prepare for FP2. McLaren will probably be happy just to finish the Australian Grand Prix, let alone win it, but it is a race they have a good record at. They've won 11 Australian GPs, with our very own David Coulthard claiming his final race win in Melbourne back in 2003. But as Jason suggests, there is still a cloud of gloom lingering over the team after a very bitty first practice. Jason Lewis: Not looking good for McLaren-Honda, five seconds off the pace and spent half FP1 in the garage with the engine cover off. The first practice session ends with a Virtual Safety Car procedure, new for 2015 after trial runs in practice last year. 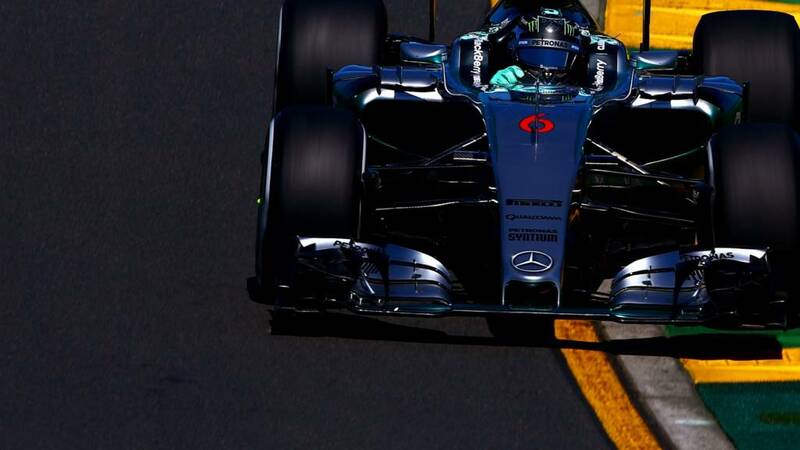 NICO ROSBERG FINISHES FASTEST IN FIRST PRACTICE FOR THE AUSTRALIAN GRAND PRIX. The chequered flag is out to signal the end of first practice, with Mercedes top of the pile. Sebastian Vettel has a little nibble of the gravel coming through Turn 12 but it does not stop him from clocking his best time of the day - a 1:31.029 which is enough to move him up to fifth. Spurge: Best looking car? Mansell's Williams FW14… absolute classic, maybe where the inspiration for Sauber's C34 colour scheme came from? Matthew Thomas: The 1995 Ferrari. If not the best looking then definitely the best sounding car. Elton Lam #79: The 7-Up livery Jordan 191. Beautiful. I bet EJ agrees! "The Ferrari looks to be a bit more precise and direct, they point and it and it goes somewhere compared to last year where they had to anticipate what it was going to do." Out goes Sebastian Vettel and Kimi Raikkonen for Ferrari for the final few minutes as activity increases on the circuit. Lewis Hamilton, Felipe Massa and Valtteri Bottas are out on the circuit, along with Toro Rosso duo Max Verstappen and Carlos Sainz Jr.
No big jumps at the top of the timesheet, with Felipe Massa nudging Pastor Maldonado down into seventh following a 1:31.417. A burst of activity as we enter the final 10 minutes of this session, with cars returning to the circuit. Are Mercedes set to top the first practice session of 2015? "I'm at the McLaren garage and Kevin Magnussen has changed out of his race suit and into his civvies while Jenson Button has gone into the hospitality area. "The team says they are investigating a mechanical issue with the power unit and hopefully things will be resolved ahead of FP2. Every lap they get today is crucial." Lotus: Getting to watch footage of the nearby lake is one way to pass the time while waiting for our next run. This brief moment of inactivity means we can check in on what Fernando Alonso has been up to this week. Training hard it seems - hopefully replete with a Rocky-style training montage - as he gets himself ready for possibly returning to the track in Malaysia. Just under 20 minutes of first practice left and silence descends on the circuit once again. "You have to feel a bit for McLaren's Kevin Magnussen. Drafted in to replace Fernando Alonso while the Spaniard recovers from concussion following his testing accident, Magnussen had only one truncated day of testing all winter. On Thursday, I bumped into him in the McLaren building and said: 'How many laps was it you did again? 32, was it?' 'Thirty-nine,' he replied, with heavy emphasis on the 'nine', his humour clear. Magnussen is up against it, that's for sure." Kevin Magnussen is also out of his car and it looks like that's that in first practice for McLaren. You would think they would be trying to get as much track time as possible after racking up so few laps in testing? A 1:30.748 sees Valtteri Bottas up into P3, behind the Mercedes duo of Lewis Hamilton and Nico Rosberg. McLaren driver Jenson Button: "I'm so excited to be back in Melbourne. After the ups and downs of 2014, I feel that the challenge of 2015 is a completely new chapter in my career and I'm totally up for it. "McLaren-Honda has been working incredibly hard over the winter, and although we would of course have liked to cover more miles in Jerez and Barcelona, I can definitely see a difference in the car from the first day to the last. "The car is a solid base which gives me optimism that we will get there, we just need patience." Jenson Button is out of his car and chatting with his team in the McLaren garage. The Australian GP has been good for Button, with the Briton having won three of the last six races, but expectations will be very much in check for this weekend. Just finishing the race will probably be considered a result after McLaren's testing troubles. Williams: Felipe jumping back in and preparing for his next run. "At the moment the Toro Rossos are out gunning the Red Bulls, but we don't know what the Toro Rossos are doing, they could be running different fuel loads. This is all about learning about the car." We've just had our first spin of 2015, with Daniel Ricciardo losing his Red Bull at Turn 15. Nothing major, though, and he quickly recovers. Speaking of Williams, Felipe Massa and Valtteri Bottas have the sixth and seventh fastest times of the session, and there is very little between them having clocked 1:31.836 and 1:31.932 respectively. As far as cars go, Williams' FW36 last season was quite a sight. #bbcf1, or text on 81111 (UK only)and I'll delve into the archives to furnish your suggestions with pics! Romain Grosjean breaks the silence to briefly stir the sunbathers on the sun-soaked grassy hills surrounding the track but it is only a brief outing as he quickly heads back in. Daniel Ricciardo, bidding to become the first Australian to win his home race, then heads out for the first time in his Red Bull to the delight of the locals in attendance. Rolo :): Hubby snoring one side of me and 10-week old baby snoring on the other but I will let them off while I listen to #bbcf1 cheering on Red Seb! MrHumiliations: Thank god F1 is finally back. Only downside will be the early starts. Well lets hope I can survive the first two practice sessions. Meanwhile it is all quiet on the circuit with everyone back in the pits. Nico Rosberg has the benchmark time with 1:29.557, with the Ferraris of Sebastian Vettel and Kimi Raikkonen second and third fastest with 1:31.510 and 1:31.557 respectively. So no Saubers any time soon then, and it looks like we won't be seeing anything of Manor in this session either. Here is Will Stevens watching his team work on his car. "From the very start of this session both Sauber drivers were sitting in their cars, there are no wheels on the cars, there is nobody standing around, there is nothing happening at all and it is almost like the two drivers are two scared to get out of the cars, just in case something does happen." Still no sign of the Saubers and it is looking unlikely we will see them any time soon, with Marcus Ericsson and Felipe Nasr both sitting in their cars in the garage, pretty much twiddling their thumbs. I've not seen any confirmation on whether or not Giedo van der Garde will race this weekend, but it looks like it will be Ericsson and Nasr taking part in practice, if they do head out in this session. "Ferrari can challenge more consistently than in previous years but I don't think they will be challenging for a world championship." We might see a rare smile on the face of Kimi Raikkonen this season after some impressive work in testing for Ferrari. He has just gone second fastest with 1:31.773s, just over two seconds off Nico Rosberg's pacesetting time. Following the helicopter crash in Argentina on Monday that killed eight French nationals, including three well-known French sports personalities, Lotus driver Romain Grosjean will wear a special helmet this weekend in tribute to those who lost their lives. "I'll be wearing a black strip on my helmet at the Australian Grand Prix,"
Sparks flying from under Romain Grosjean's Lotus as he throws the car around the Albert Park circuit before Max Verstappen runs a little wide at a corner, but no drama. Still just the two Mercedes with times on the board in these very early stages of practice. Matthew Bruce: "Do I go to sleep or stay up and listen to the F1? I reckon Mercedes will still be on top maybe even further ahead than last year!" I think we both know the answer to that one Matthew, pop the kettle on and power on through! Lewis Hamilton is next to complete a timed lap with 1:32.044s, before his Mercedes team-mate Nico Rosberg improves with a 1:29.557. The Mercedes are out and Nico Rosberg is first to pop a laptime on the board with a 1:31.319s. Rosberg was all smiles in the paddock before the start of practice, donning a red nose for Red Nose Day, but he is very serious about his ambition for 2015. He is determined to beat Hamilton to the title. "Question marks over whether Manor F1 can run, due to software. Cars have been scrutineered though, so they are part of the meeting." It is fantastic to see Manor in Australia, having only been cleared to compete at the opening race of the season last week. The team, who competed as Marussia last season, came out of administration last month, and are set to race in Melbourne with a modified version of their 2014 car. Manor F1: The first FP1 of '15 is underway. We've experienced a few hurdles to get here so we're not expecting our first morning to be plain sailing. Whatever happens in the next 90 minutes, we certainly won't be in for a repeat of last year's first practice in Australia. On that occasion, Fernando Alonso set the pace with a time of 1:31.840 in the Ferrari. His team-mate at McLaren this season, Jenson Button, was second fastest. After a torrid time in testing, how McLaren would love to be in a similar position by the end of first practice in Melbourne this year. Kevin Magnussen takes the McLaren out on to the circuit and 10 of the 20 cars have ventured out six minutes into this session. Mercedes: That beautiful sound... that beautiful smell... we're all fired up & ready to rock. The green light is on and the very first practice session of the 2015 season is under way! Max Verstappen, the 17-year-old Toro Rosso driver, leads out the first few cars on to the circuit. As mentioned earlier, Fernando Alonso is not in Melbourne as he recovers from his pre-season testing crash. Kevin Magnussen is stepping in for him this weekend, with Alonso hoping to be back in the McLaren for Malaysia. "Of course, I'm very disappointed not to be joining Jenson in Melbourne in the McLaren-Honda garage, but I understand the recommendations of the doctors and I'm already back in training and preparing for my first race in the MP4-30," he said. "Even though we faced a lot of challenges in the tests, I am very encouraged by the feeling I got from the car, and I'm looking forward to going through all of the data from this weekend with the team to continue our push for development and improve our performance." Giedo van der Garde is certainly preparing to race. He is at the circuit today and is decked out in Sauber overalls. "The new Formula 1 season is only just getting under way and already the sport's uncanny ability to generate controversy is in full swing. There's a team - Sauber - that has three drivers for two cars after a quite incredible court battle. There's another team - McLaren - whose lead driver is not even here after suffering concussion and whose replacement has done less than 40 laps in the car he will race this weekend. There is a continuing row over rules and, by extension, money in the sport. "Already it is clear this is not going to be a quiet weekend." An engine has yet to be fired up in anger and we have already had plenty of Formula 1 drama this week with some bizarre shenanigans at Sauber. It revolves around Giedo van der Garde, a former test driver for the team, who says he was promised a race seat for this season, a claim backed by the Victoria Supreme Court this week. That has led to huge uncertainty about just who is going to drive for Sauber in Australia. Will it be their current drivers - Marcus Ericsson and Felipe Nasr - or will one of them have to make way for Van der Garde? How would they even decide who drops out for Van der Garde? Draw straws? Eeny meeny miny moe? Not long until the first race weekend of the 2015 season officially gets under way, so let's have your thoughts on the season ahead. How do you see this year's title battle shaping up? Who will surprise us? Can Sebastian Vettel revitalise Ferrari? Who will be the best-performing rookie? #bbcf1, text in on 81111 (UK only) or have your say on the BBC Sport Facebook and Google+ pages. So here's how today will shape up. First practice starts at 01:30 GMT, with audio commentary online by clicking on the 'Live Coverage' tab at the top of this page. That runs until 03:00 GMT before second practice gets under way at 05:30 GMT. For those you based in the UK and powering through the night with us, I tip my cap to you. Can Ferrari cook up (sorry!) a surprise or two this season?Image caption: Can Ferrari cook up (sorry!) a surprise or two this season? Williams looked closest to Mercedes in terms of pace during testing. Valtteri Bottas' best time of 1:23.063 was just 0.041s off Lewis Hamilton's benchmark, although Bottas' time was set on the supersoft tyres, with Hamilton and Rosberg clocking their best efforts on softs. Nevertheless, they look likely to be at the forefront of 'the best of the rest' but Ferrari will also be quietly confident of impressing after a showing plenty of progress throughout testing. They caught the eye by topping the timesheets early in testing before Mercedes' showed their hand, but still gave enough of an indication that they should be up there with Williams this season. "We leave the winter testing pretty happy with the way the car is performing, the way the test has been done and the way the team is operating," said Ferrari technical director James Allison. In stark contrast to Mercedes' smooth sailing in testing, McLaren endured not so much choppy waters, but a veritable tidal wave of problems. Fernando Alonso and Jenson Button managed a total of just 380 laps, or 1,751km, across the 12 days of testing, and only twice did the team complete more than 58 laps - the race distance of the Australian Grand Prix - in a single session. Add to that Alonso's crash on the final day of the second test, which left him concussed and ruled out of this weekend's race, and it has been far from an ideal start to 2015. It is fair to say expectations are very much in check for the opening rounds of the season, with McLaren racing director Eric Boullier not expecting the team to be competitive until first European race in May. Mercedes: Welcome back to the Australian Grand Prix folks! Under 30mins and we're back on track... let's do this!! Surprise, surprise, Mercedes were dominant throughout winter testing. Lewis Hamilton and Nico Rosberg racked up 1340 laps, or 6,121km, between them across the 12 days and three tests with the W06 looking quick and reliable. Indeed, Nico Rosberg clocked the fastest time of all three tests, with his time of 1:22.792 at the Circuit de Catalunya ominously almost three seconds faster than the 2014 Spanish Grand Prix pole time of 1:25.232, set on the same circuit. Last season showed us they are not without their reliability problems, but once again they look the team to beat, and by some distance. Ahhh the sweet, sweet sound of engines will soon be filling the Melbourne air, and the first practice session of 2015 is almost upon us. Before we crack on with the here and now, and believe me there is plenty to talk about regarding events in Australia this week, here is a quick recap of what we learned in testing. "The phoney war is about to end. All winter, pretty much every team and every driver has been talking about how 'positive' they are for the new season, but this is the moment of truth. Are Mercedes as far as ahead as everyone thinks? "Have Ferrari really started a revival, as Sebastian Vettel and Kimi Raikkonen have been suggesting this winter? Can Lotus recover some credibility with a car Romain Grosjean was saying on Thursday is night and day different from last year's monstrosity? Just how much trouble are McLaren-Honda in? "Answers to all these questions and more are about to be revealed." Hello and, depending on where you are following from, good morning, good evening and good night! Our body clocks may be all over the shop, but who cares because this, for us F1 fans, is Christmas Day - the start of a new season. Who is going to be dominant? Who will surprise us? Who will disappoint us? We won't know the answers to all those questions by the end of this weekend, but we sure as heck will be treated to a teeny, weeny glimpse of the lay of land. Dum. Der der der de de de der der dum. Three months and 19 days on from the moment Lewis Hamilton stretched the Union Flag out behind him and celebrated becoming a double world champion, Formula 1 is back. ...but regardless of whether the teams are ready, for the rest of us it is almost time to get out the air guitar and prepare for those spine tingling famous chords of The Chain. Welcome, to the start of the 2015 Formula 1 season.